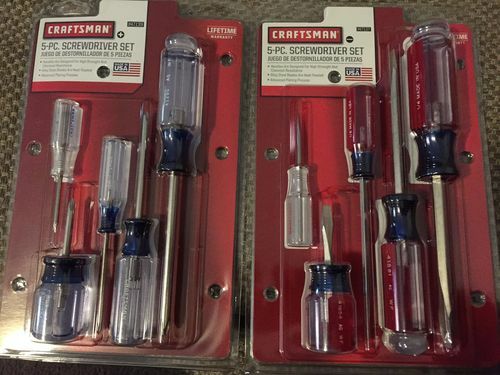 Craftsman Made in the USA Screwdrivers in 2018?! Maybe they still do this, but I don’t recall seeing anything “Made in the USA” on any Craftsman tools in a long time. I thought all of them moved overseas. I just bought these screwdriver set from Ace Hardware, brand new, and all of them says Made In the USA. They look and feel like the ones my father use to have in his mechanics tool box. Smells the same too. lol. If this is a new thing, maybe Stanley is already having an effect. If this is old news, then I’m glad to see these are still around. The fact that they “smell the same” may indicate that they’ve been around for a while. If you’re referring to that “vinegar” smell—that is a by-product of the decomposition of cellulose acetate butyrate—the stuff the handles are made of. If you’re referring to something else, then just ignore this post. The fact that they “smell the same” may indicate that they ve been around for a while. If you re referring to that “vinegar” smell—that is a by-product of the decomposition of cellulose acetate butyrate—the stuff the handles are made of. If you re referring to something else, then just ignore this post. Yeah, definitely something else as these were brand new shipment from Craftsman. I paid for them during the holiday time when they were sold out, so they took an order for the next shipment, which was today. AFAIK, their screwdrivers have always been made (since the late 60’s?) by Western Forge, which is a US based company and has all of their manufacturing facilities in the US. AFAIK, their screwdrivers have always been made (since the late 60 s?) by Western Forge, which is a US based company and has all of their manufacturing facilities in the US. looks like you’re correct Brad. It is marked with WF on the handle, which is the mark from Western Forge. I did see the article about Ideal stopping the supply of tools to Sears in April 2017, so I wonder what happened that Sears were able to continue shipping these? I’m kind of interested in what Stanley is currently doing with the brand. In my experience, as a construction worker, the craftsman screwdrivers are the ONLY craftsman tools worth spit. Never tired their hammers though. The term “Made in the USA” isn’t regulated. I expect the steel is from China and they mold the plastic handles onto the steel and package them in the USA. It’s a start. My favorite thing about the Craftsman screwdrivers is I can easily just walk into a dealer store and get a new phillips to replace the one that has rounded out.